Bears and Webelos can explore the natural wonders of the Missouri Botanical Garden in all seasons with a variety of fun, nature-inspired programs. Some programs are aligned with scout badges and meet the necessary requirements for each adventure or elective. Others explore nature and STEM concepts without resulting in an award. See each program's description for details. NO Cub Scout Pack and Den programs will be held at the Missouri Botanical Garden July–September 2018 and December 2018–February 2019. Consider scheduling a program at Shaw Nature Reserve or the Butterfly House during these times. Take a scientific discovery walk with us! We'll employ methods used by Naturalists to search for the animals that inhabit our beautiful sites. Learn all about Missouri's endangered species and create your own imaginary animal from clay. Search for wiggly worms in our vermicompost bin and plant a veggie to take home! This program meets all the requirements for the Bear Adventure Fur, Feathers and Ferns. Program length is 2 hours. This program is available March-June and October-November. Our Garden contains almost 5,000 trees! Discover how to identify Missouri's native trees as well as plants. Use this skill on a hike to find wild edibles. Scouts will also examine tree cookies and learn the science behind dendrochronology, the study of growth rings in trees. Visit the Climatron to learn about the importance of some of our exotic trees as well! 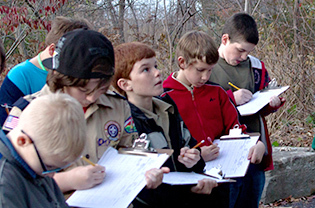 This program completes requirements all of the AOL/Webelos Elective Adventure Into the Woods. This program goes towards completing the Dr. Charles H. Townsend Supernova Award for Webelos. Program length is 2 hours. This program is available May-June and October.